If all you knew about this match was the things that went wrong for Leinster you'd insist that the final scoreline had to be the other way around. Lineout darts were going astray, tackles were being missed, try scoring opportunities were being butchered [sadly by the same player], kicks were going out on the full, we shipped a yellow card, we had to go to our bench twice in the opening twelve minutes...when it's all put together you can only conclude that it's just not to be your day. But then you look at what happened on the Ulster side and things take a completely different turn. And I want to make it clear that my pointing this out is absolutely nothing to do with wanting to mock or ridicule, even for supposed 'banter'. What I actually want to do is briefly highlight the horrendous run of bad fortune our northern neighbours have had over the years. They are the province that has gone longest without silverware [2006 Celtic League when there were no playoffs and they pipped Leinster by a point thanks to a late David Humphreys drop goal in Swansea] and since then it really has been a case of Murphy's Law for them. Some of the individual cases shouldn't really be brought up on these pages for varying reasons, but when put them all together it's hard to dispute that since that league triumph Ulster have been denied a host of talent, and given how Irish Rugby is structured meaning you have limited playing time for your best players anyway, it is bound to have an impact on performances. This unlucky streak was compounded in 2013 when, having managed to get themselves to the top of the Celtic League ladder, they had to concede the Grand Final home advantage due to capacity restrictions, and to make thing even worse, they end up facing the very team who calls that alternative venue home. All just a year after getting to a second Heineken Cup final only to lose badly to...well, I won't say it. Of course we've had our own setbacks over the same time period but on nowhere near the same scale, and the trophies certainly helped. Again, I don't say this to gloat, rather to show appreciation for the fact that Ulster fans still remain so loyal to their province. Some came away from the Kingspan choosing to highlight the booing of placekickers on the night...for me, that doesn't even come close to defining the true Ulster faithful who stand up for their heroes every chance they get. And they certainly started this latest iteration of the oldest interprovincial brightly. My biggest concern from Leinster's starting lineup was that we were vulnerable defensively down the middle and sure enough the game was barely a minute old when a cut back pass to Luke Marshall breached our front line of tacklers, yet not for the first time this season, our scrambling was good enough to snuff out the danger with a jackling penalty courtesy of James Tracy. From there it seemed the pattern was set for the match...Ulster would do a good thing only for it to be undone by a bad one by them and/or a good one by us. Meanwhile when we made a mistake, either the home side would respond in kind or one of our players would do something impressive to bring us back. Take the opening quarter, for example. Ulster had the ball for much of it yet could only turn it into a 3-0 lead. When Leinster eventually saw some possession and territory we came within an ill-advised kick pass by Gibson-Park [more on him later] of a score before Jordan Larmour, on for Noel Reid after impressing for the B&I Cup side last week, sold Iain Henderson [who otherwise led the match with 23 tackles] down the river before powering over at unstoppable speed. All credit to the Ulstermen; from there they enjoyed an even better purple patch, with more neat work along their strong backline getting rookie scrumhalf Aaron Cairns over only for it to be held up. From the resulting scrum however they got a decent shove on for Sean Reidy to take it and barge his way over the line to pinch back the lead for his side. Now it was our turn to crawl our way back and while we weren't to breach their line again before the break, we did earn a couple of penalties for Ross Byrne to knock over and get us back in front. Given the final scoreline, it has to be pointed out how evenly the match was poised as late as the 55 minute mark. Yes, we were in the lead, but only by three points and as Ulster managed to get the ball into the wide channels where they had numbers, Dave Kearney copped a yellow card in similar fashion to Niall Scannell for Munster against us a few weeks back. So with the extra man, it looked very possible that the home side could find the extra space to nudge back in front. But it was right from the start of that ten minute spell where things begin to really unravel. The penalty from the Kearney no no was put into touch and Rory Best, on his 200th appearance for his province, got tagged for a crooked dart that wasn't his first on the night. So we take the scrum and pin them back in their own 22. Then Rob Herring, just on for Best, throws his first dart too long and we retrieve; with a narrow lead away from home we're happy enough to kick it back to them. Eventually an ironic cheer goes up around the Kingspan Stadium as a lineout is successfully taken but then prop Rodney Ah You, who had made some noteworthy hits earlier on, lost the ball himself as he was tackled and it fell to the feet of Devin Toner at the halfway line. It looked as though his instinct was to scoop it to a player close to him but he was getting a shout from his captain and he was composed enough to get it over to him. I always figured Sean O'Brien could do well with the captaincy. A bit like Peter O'Mahony at Munster I thought it might take him a while to forge a diplomatic rapport with officials, but in the area of leading by example there could be no question, and right here is where he showed it. It's not much good calling for the ball if you don't have a plan to do something with it, and it seems that Seanie knew exactly how to exploit the numbers matchup that faced him in the wide channel. Cool as you like he sets off letting go a pass to Adam Byrne in support at just the right moment and stays with his winger to get it back. Then even cooler as you like he throws a cheeky dummy to take another Ulsterman out of the equation before shipping it to Luke McGrath who makes a beeline for the corner. Was the final pass forward? Maybe it was worth a look, but for me, it would have been harsh to call it. Superb work that makes me even more certain that The Tullow Tank should move up our captain's pecking order ahead of Sexton [not because J10 isn't able, rather he has enough on his plate when he plays]. So there we were, two scores ahead despite being a man down. From then on we pretty much coasted home, thanks mostly to another solid outing from the bench, many of whom combined for a third try close to full time - after Richardt Strauss was held up over the line, it was our turn to make the most of a 5m scrum with carries from Conan, Healy and Molony before Luke McGrath bagged his second - a great return from the scrum half that further cements his status as Leinster's number one number nine. On Jamie Gibson-Park....I've said this before and I'll say it again - it's not that I feel he's a bad player. In fact, after it was known he was coming to Leinster I watched him play several times for the Hurricanes and I know he can play. He just hasn't been able to adapt to the way we play the game here. There were certain ways we did things even before Joe Schmidt established his micromanaged systems - and when I watch JGP, particularly when he starts, it often looks as though he's trying to zig when his head is telling him to zag. And now he has been here for more than a full season, he might feel the pressure to impress starting to weigh on him, leading him to make rash decisions. In the early stages when we had our first chance deep in their 22 he chose to kick pass to Adam Byrne when a few more phases could have been more productive, then in the second half with the line at his mercy he chose another more difficult option rather than go himself, and it certainly didn't help his cause that his replacement went on to score twice. But back to the positive, on the Leinster side I said before the match I'd be looking for a good outing from Rob Kearney and I have to say he did well - the run backs often got us on the front foot and he seemed to use the ball intelligently. And despite the poor night overall for the Ulstermen, I am always impressed by Jacob Stockdale out on the wing, as I'd say was the onlooking Ireland coach. 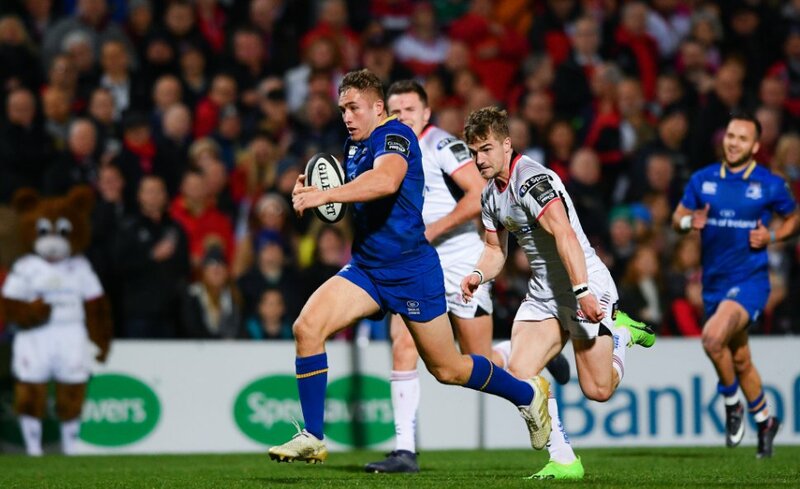 So a second good away win on the bounce for Leinster, and with exactly a third of the regular season gone in the Pro14, it now looks like we could be scrapping it out with the reigning champion Scarlets for top spot in Conference B. Looking ahead on the schedule, however, I see we play them twice smack bang in the middle of the Six Nations, ironically either side of Ireland v Wales clash so it won't be with full squads. Can't have everything, I suppose.